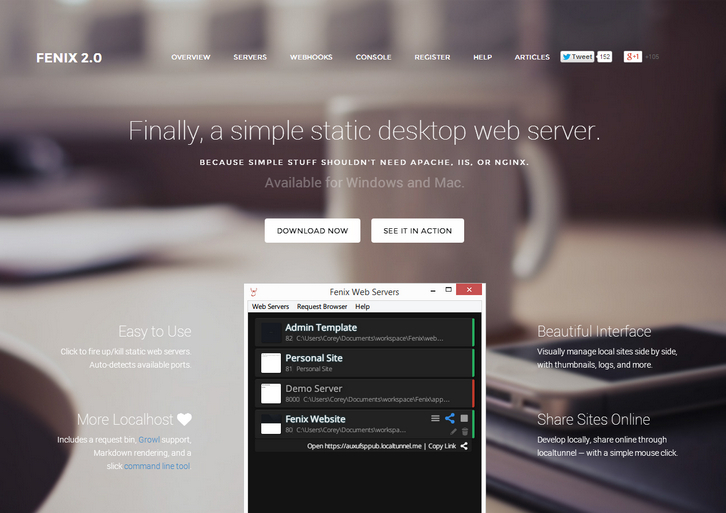 Fenix is a simple static desktop web server for developers. You can work on multiple sites simultaneously. Serve any number of HTTP projects side by side with Fenix. Fenix serves and receives. View JSON, XML, and other webhook payloads with the request browser. You can create, stop, start, and share Fenix servers from the command line with the free Node.js console app. Now you can turn your desktop into a public web server by sharing a link. Let collaborators/reviewers “touch and feel” the site. Great Web server with a Multi Tasking Functionality as simultanoeously many web sites can be handled at a time. Nice work guys. i loved your template.